The past decade plus has brought too many reprehensible stories of bullying that have resulted in suicides and retaliatory killings. As I’ve always understood it, a bully is stereotypically a big-mouthed brute who tries to rule the playground or the lunchroom by intimidating others with verbal and physical threats. He particularly delights in going after littler guys to make himself look big, or after potentially threatening people to make himself look powerful. If the bully isn’t strong enough himself to back up his threats then he has his henchmen who are ready to step in to give the needed show of force. For a more thought-out definition with better information, I turned to the Wikipedia article on “bullying.” Here is some of what I found described there. Bullying is aggressive behavior that expresses itself by the use of force or coercion to affect others. It can include verbal harassment and may be directed repeatedly toward particular victims sometimes on the ground of religion. One of the basic types of bullying is verbal and it typically involves subtle methods of coercion such as intimidation. 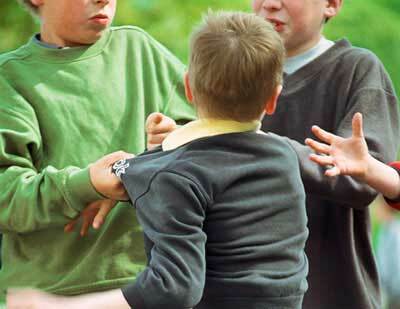 Bullies may have “lieutenants” who willingly assist the primary bully in his or her bullying activities. Bullying can occur in any context where humans interact with each other including interaction between social groups. So, there is this family who has built a successful business by having a cow encourage people to “EAT MOR CHIKIN.” The president of this business is a Christian who believes the Bible, and that has led him to conclude that gay marriage is wrong. Mind you, he doesn’t deny gay people courteous service in his restaurants, nor does he deny them employment based on their sexual preferences. He just happens to believe homosexuality is wrong and that marriage, as defined by God, is a relationship that exists between a man and a woman. For having the audacity to say that, this man and his business have been targeted by the gay community and politically-correct politicians who, with their willing lieutenants in the media, have engaged in a barrage of hateful verbal assaults, seeking to intimidate this business owner into adopting and advancing their agenda. It isn’t acceptable to them to just be courteously tolerated in their beliefs and behaviors; they demand outright approval, and anything less than that is equated with hate and therefore a legitimate target for their assaults. These supposed perveyors of tolerance expose themselves as nothing more than a gang of intolerant bullies who prey upon a particular religious segment of our society. That’s what went through my mind when I read about the nonsensical controversy that erupted over Chick-fil-A’s president Dan Cathy’s affirmation of a biblical definition of marriage. It is a controversy ignited by gay-rights advocates, grand-standed by politicians who intend to shut these restaurants out of their communities, and advanced by their media lieutenants. When I heard the story I thought, you’re kidding me, right? A successful American business owner who makes really good chicken sanwiches, waffle fries, and lemonade is not allowed to voice his beliefs regarding marriage from the Bible without hysterical screeching from those who believe otherwise? Wow! There really are those in America who don’t want people to have the right to believe what they want to believe and say it, who are willing to target those people, and use bullying techniques to intimidate them into silence with verbal harassment. Perhaps the most amazing part of this is that those who engage in these bullying methods are portrayed as the tolerant ones. The natural anger this story stirs up inside of me is quelled when I remember one simple reality: that’s our world. As a Christian who believes God’s Word, I get it that America is part of a world system that doesn’t love or respect the God who has revealed himself in the Bible. I get it that as a Christian I am a foreigner in this world even though I live in America. I get it that I am not to be surprised that this world doesn’t simply ignore God’s Word, but actually hates it and hates its messengers. Jesus said that would be the case. I get it that I am called, by the grace and mercy of the gospel, to be tolerant of intolerant people, even, if necessary, to turn the cheek to bullies. When I use the word “tolerant” I am referring to the old definition: “respecting people and treating them kindly even when you believe they are wrong.” I can disagree with someone and believe they are wrong but still treat them kindly and respectfully. I can even be friends with someone who believes differently from me. But that’s not the definition of tolerance used today. The new definition, “never regarding anyone else’s opinion as wrong,” means that even suggesting that someone’s belief or opinion is wrong is intolerant. I believe any individual has the right to believe what he or she wants to believe. I would hope for the same in return, which seems reasonable and for most of its history, has been a very American thing to do. However, I also get it that if what I believe actually happens to be the truth (truth being defined as that which corresponds with reality), then there will be those who don’t want it spoken because when everything is said and done, truth wins. Since the one operating the levers of this world’s system is a liar, I am not surprised by the bullying techniques used to silence truth. So, in the meantime, I will be thankful for people like Dan Cathy who will not be intimidated into silence. I will pray for the courage to do the same. But at the same time I will love those who believe differently than I believe, and behave differently than I behave. I will resist the temptation to view myself as superior to them. I will not be drawn into their intolerant hatred. I will be sad for them for I know that one day they will stand before the God they ignore and reject, and on that day their bullying won’t work. They, with all their lieutenants, will be silenced once and for all. For you see, while I believe in an individual’s right to believe what they want, I also believe that accompanying that right is the fact that every individual will answer to God for what they have chosen to believe and they will reap the consequences. This entry was posted in Uncategorized and tagged Criticism, current-events, Family, Politics, religion, society. Bookmark the permalink. I often have thought the same as to how intolerant so many liberals are, even as they accuse people like us of being intolerant. If we had Chick fil-A here in CNY, we’d be giving them our business. We have to remember that the servant isn’t above the Master; if Jesus was persecuted so will his followers be. We, in the U.S., have been sheltered from all this but that is changing rapidly. Now we are beginning to get an inkling, albeit on a much smaller scale,of what our brothers and sisters in Christ around the world have been going through. Be prepared for things to get much worse.